​We have now completed the "lap" and are back in Western Australia. We certainly knew that we were on a cliff top last night. Lashing rain and strong winds rocked the van and when we woke this morning we and other vans were surrounded by a mini lake! 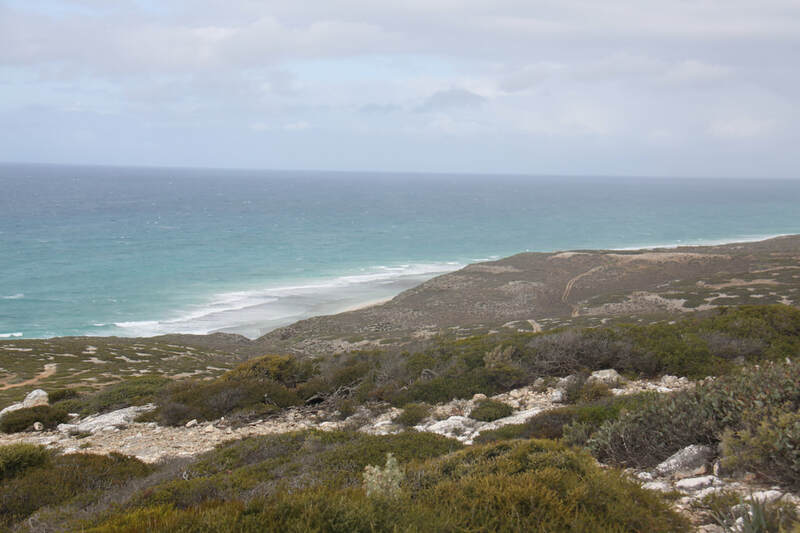 Before reaching the South Australia/Western Australia border we made one final stop to view the ocean below. The sea was very rough with lot of white horses. From now on the Eyre Highway runs further inland. On reaching Border village we discovered that it really is no more than a roadhouse and the quarantine inspection station. Nicolle was duly inspected and pronounced free of fruit, vegetables and honey, all items that cannot be taken into Western Australia. We had to put back our watches by two and a half hours due to the change of time zone. Gradually the scenery is changing with more small trees appearing. All day we have been following the line of a bluff, the remains of an ancient sea cliff. For most of the day we were on the plane below it, which at one time would have been underwater, but later in the afternoon the road climbed to the top of the cliff to give us good views over the arid plain below. We woke to brilliant sunshine at 4.30am thinking how ridiculous yesterday's time change was! The only thing to do was turn over and go back to sleep until a more sensible time. Continuing our journey across Nullabor we soon reached the roadhouse at Cocklebiddy. We were pleased to be able to buy an apple and pear for lunch and a banana for tomorrow's breakfast. An amusing sign detailed the population - "8 people, 25 budgies, 7 quals, I dog and 1,234,567(dead) kangaroos". There is certainly a lot of roadkill along the highway, apart from the road trains, most people keep off the roads after dark. Another long section of virtually empty highway took us to the next roadhouse at Caiguna, after which comes the longest straight road in Australia, "the 90 mile stretch". Ninety miles dead flat with the motorhome in cruise control and no steering involved - distances may be big here but the driving is easy! 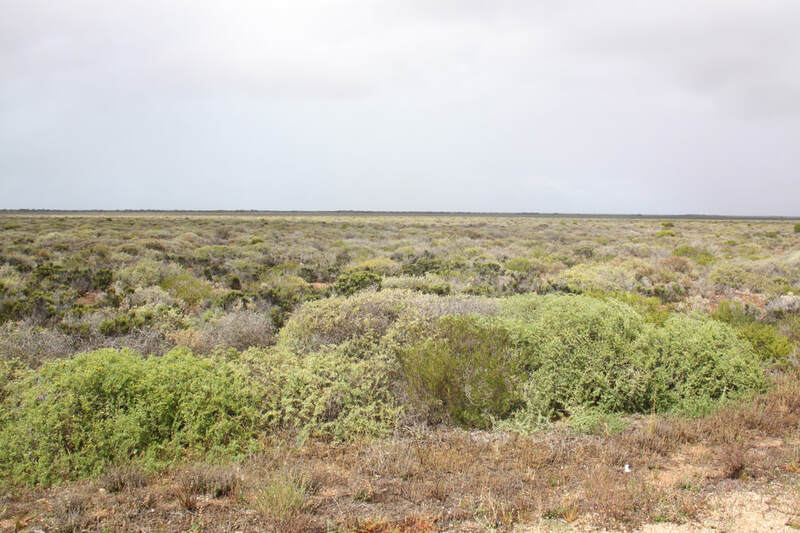 The scenery kept changing - true treeless Nullabor plains, low scrubland or areas of bushes and small trees. We stopped again at Balladomia where the roadhouse has a small museum. Its star attraction is pieces of space debris from Skylab which landed in a nearby sheep station. A few miles past the roadhouse, signs warned us that the road doubled up as an emergency landing strip for the Australian Flying Doctor Service. Just before stopping for the night we reached the start of the Fraser Range, an area of granite hills on which grows what is believed to be the oldest intact temperate woodland in the world. The Great Western Woodlands cover an area about the size of England. Our stop tonight overlooked a shallow salt lake surrounded by trees. A short drive this morning brought us to the end of the Nullabor and the end of our journey along the Eyre Highway at Norseman. This small gold mining town got its name when, in the 1890s, a prospector tethered his horse whose name was Norseman, to a tree for the night. In the morning, the horse's pawing at the ground had unearthed a piece of gold-bearing Quartz. 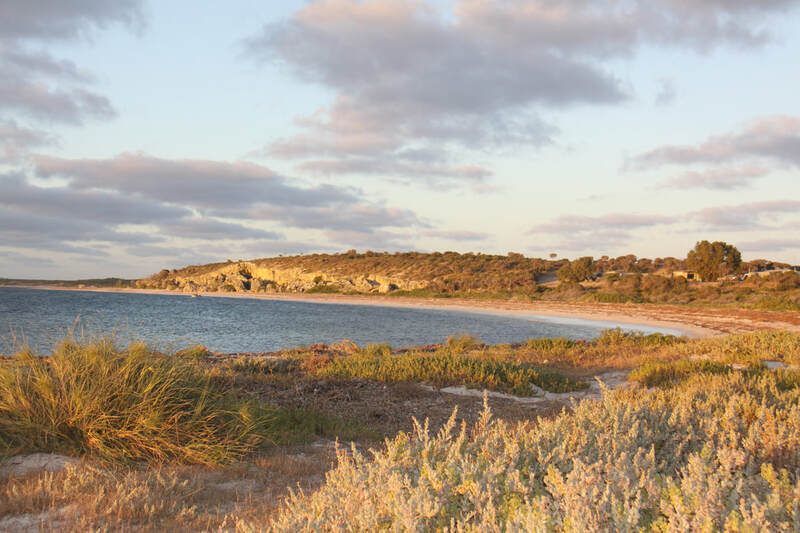 The area proved to be the second richest goldfield in Western Australia. After the mine became uneconomic and closed, the remaining spoils which still held remnants of gold, were used as the base of the town's roads, so the streets are, literally "paved with gold". 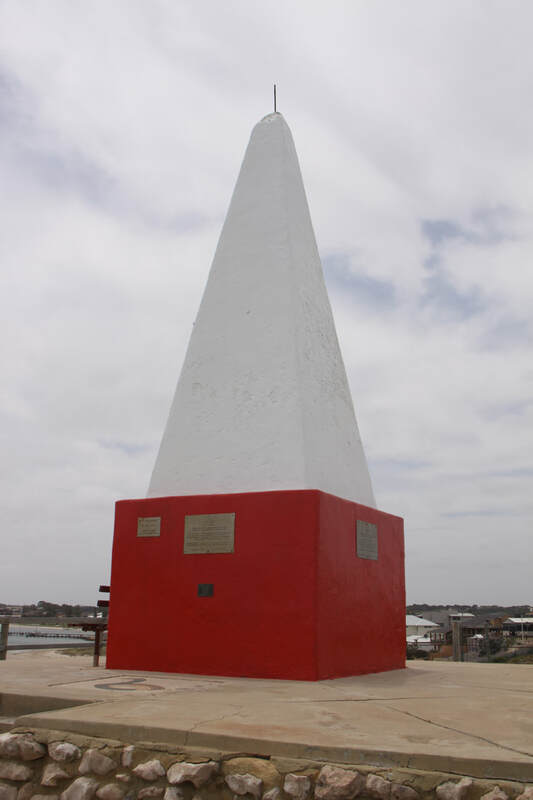 Today, Norseman is a pleasant service town for travellers starting or finishing their journey across the Nullabor, all 1194 kilometres of it. John had enjoyed it so much he wanted to turn round and do it again! At long last we found wifi, the first for over a week, but there was still little fresh produce in the one and only food shop. It was a hot day and we still hadn't adjusted to the time difference so we decided to stop early and rest. The sun may rise at around 4.30am but it is pitch black by 6pm! This morning we drove south to Esperance through ever changing scenery ~ the beautiful eucalyptus forests gave way to scrubland dotted with shallow salt lakes before arable land dominated the scene. We have definitely left behind the dry arid conditions of the Nullabor plains. 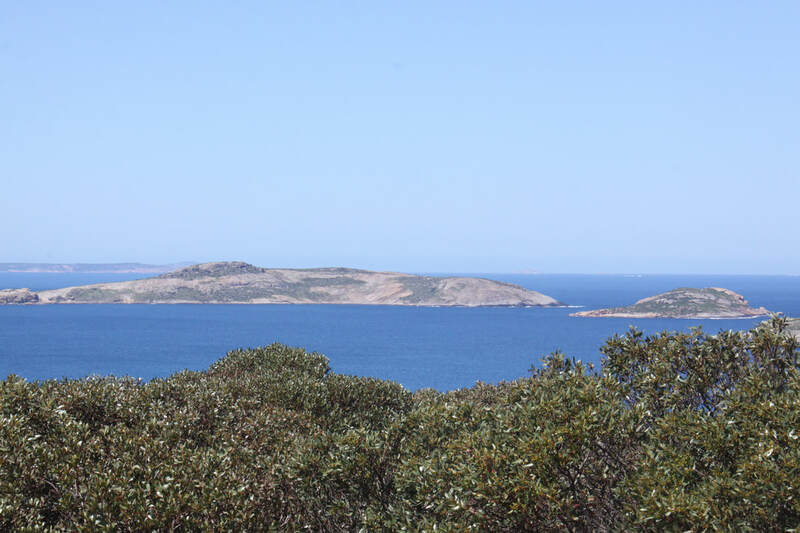 Esperance is surrounded by magnificent coastal scenery known as the Bay of Islands. 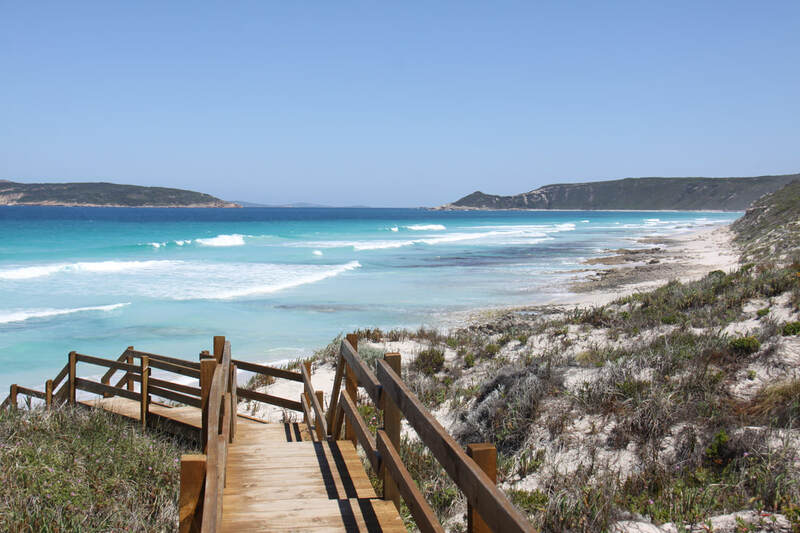 We booked into Esperance Bay Holiday Park for two nights as there are a number of places to visit in the vicinity of the town. It rained very heavily all night and the pounding of rain on our roof kept us awake. Our campsite neighbours didn't help. They were noisily banging car doors, constantly opening and closing them for ages, then started the engine and left it running until it warmed up. Eventually, they left at 5.30am! It was still raining when we got up and continued to rain until lunchtime. Our plan had been to visit Cape le Grand National Park but by the time we had decided that the weather was good enough for it to be worthwhile, it was too late to set off on the three hour return trip just to get to the park entrance. Enjoyed an afternoon relaxing in the sunshine and a trip to the local cafe for dinner. What a contrast from yesterday's deluge ~ a lovely bright morning just perfect for driving Esperance's Great Ocean Drive. This is a 40km circular loop road with amazing views of the islands of the Recherche Archipelago. Stunning white sandy beaches are interspersed with low rocky headlands, with an azure sea lapping the shore. Twilight Beach and Cove, which was voted Australia's best beach in 2006, where particularly picturesque. At the end of the loop is the Pink Lake which is no longer pink! In the past, due to high concentrations of salt, the lake was pink, but in recent years salt has been extracted commercially and there has been an increase in fresh water seeping from ground bores. From Esperance we headed west through alternate areas of mixed scrublands, wheat fields and pasture grazed by sheep and cattle. We stopped for the night at Ravensthorpe, a small service town for the area. We had hoped to find wifi at the tourist office but it was closed by the time we got there. Before leaving Ravensthorpe this morning we went to view the three grain silos in the town. Each silo has two murals painted on it, one on each side. The artwork follows the flowering cycle of the Banksia, a plant native to the region. From Ravensthorpe we headed south to the small coastal town of Hopetoun. It was a very quiet town with little open despite it being a sunny day. We parked in a designated motorhome parking area behind the sand dunes and set off to explore, only to be driven back by flies. We've been plagued by flies a number of times during our time in Australia and we don't like them! The rest of the day was spent relaxing in the motorhome, listening to the surf pounding on the beach, with the insect window nets firmly in place. Today we headed back inland to Ravensthorpe. En route we spotted some of the town's farm gate art, sculptures made from wood and scrap steel. Unfortunately, the town's tourist office was still closed ~ we would have liked to pick up the advertised brochure that explained more about them. Scattered around the town were a number of benches made of scrap materials with carvings of local fauna on the back rests. 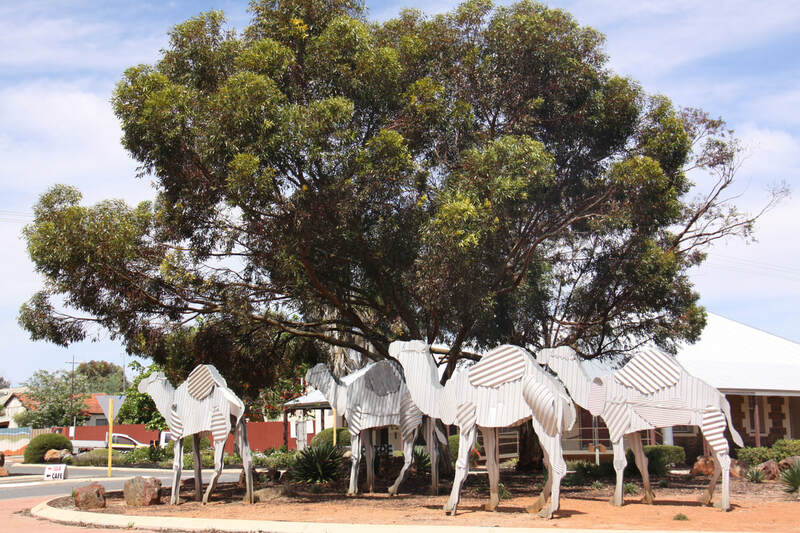 From this quirky interesting little town we headed to the area known as the Wheatbelt. This is a vast fertile region lying between the west coastal strip and the true outback. Although the land is predominantly given over to arable land there are still many areas of mallee forest and beautiful eucalyptus trees. At one point we saw a mallee fowl grazing in the fields. We would have loved to have followed one of the many Spring Wild Flower Trails, but as soon as you venture outside, swarms of biting flies surround and attack you! As we drove to the Wave Rock Resort near Hyden, we left the fertile wheat belt behind and entered the arid plains of the outback. We booked into the caravan park, put on our headsets and, braving the flies, headed off to Wave Rock. Wave Rock itself is just one small section of the granite outcrop known as Hyden Rock. 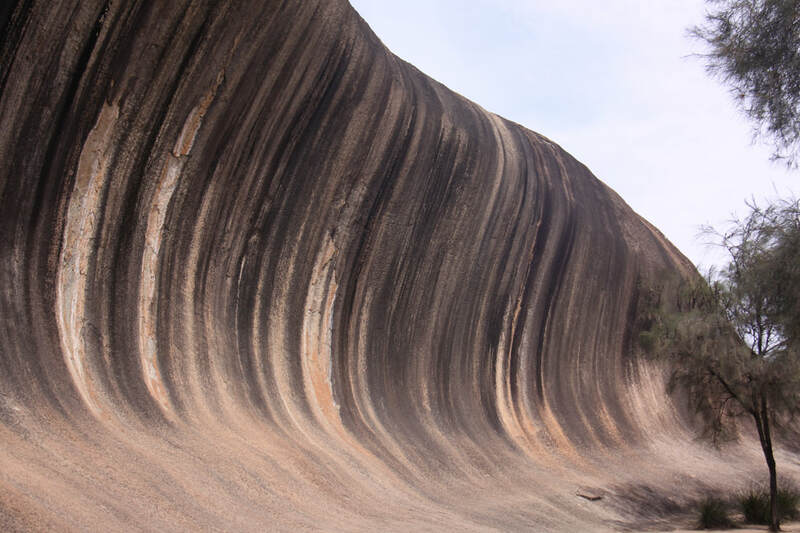 Wave Rock is a cliff face, its rounded wave like shape is the result of weathering and water erosion which has undercut the cliff face to leave an overhang. Subsequently water running down the rock face has dissolved minerals to cause a stripe effect. We followed the Hyden Rock trail which took us to the base of Wave Rock then up on to the top of the main rock formation by means of steps and steep sections with handrails. The climb itself was well worth the effort just for the views from the top. A three hundred and sixty degree panorama took in other rocky outcrops and salt lakes reaching far into the distance. A second loop trail followed the base of the rock through scrub to the feature known as Hippo's Yawn. Here an enormous Boulder with a hollow interior (known as a Tafone) looks exactly as its name suggests. The return path took us past elegant salmon gum trees standing in patches of brightly coloured wild flowers. After a tasty lunch at the resort cafe, we admired the costumes in the small lace museum, some of the exhibits dating back to the 18th century. A 1919 Model T Ford was also on display. It was very hot so the rest of the afternoon was spent relaxing on the campsite. This morning we headed back west for a short while so that we could view the line of the original rabbit proof fence. Rabbits were introduced to Australia in 1788 and kept in cages but in 1857, Alexander Buchanan released some for hunting sport! ​At the time of the original (No.1) fence in 1901, rabbits were causing extensive damage to cereal crops. 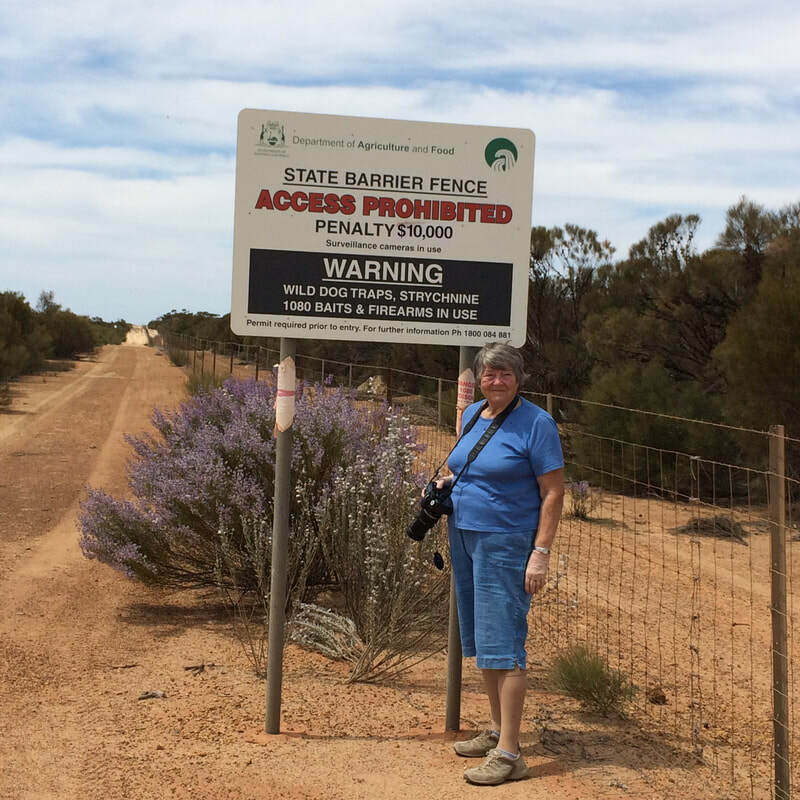 This fence was the longest fence in the world, stretching from just west of Esperance on the south coast to 80 Mile Beach in Northern Australia. The rabbit invasion was not halted so No.2 fence, then No.3 fence were put in place. By 1908 there was over 3000km of fence line! The section we viewed today was in excellent order. They certainly take keeping rabbits out seriously, there was a notice warning that there were traps, poison, guards with machine guns and anyone found damaging the fence would be subject to a fine of $10,000. North of Hyden Rock is another granite outcrop known as The Humps. A short walk from the carpark is Mulka's Cave, significant for its Aboriginal Rock Art. Inside the cave complex there are literally hundreds of hand prints, interestingly more left than right hand. After lunch a short drive took us to our overnight halt in Kondinin. Again we headed west to the start of the Tin Horse Tourist Route. On the way, driving down a narrow road, a kangaroo leapt out in front of us and hopped quickly across the road. 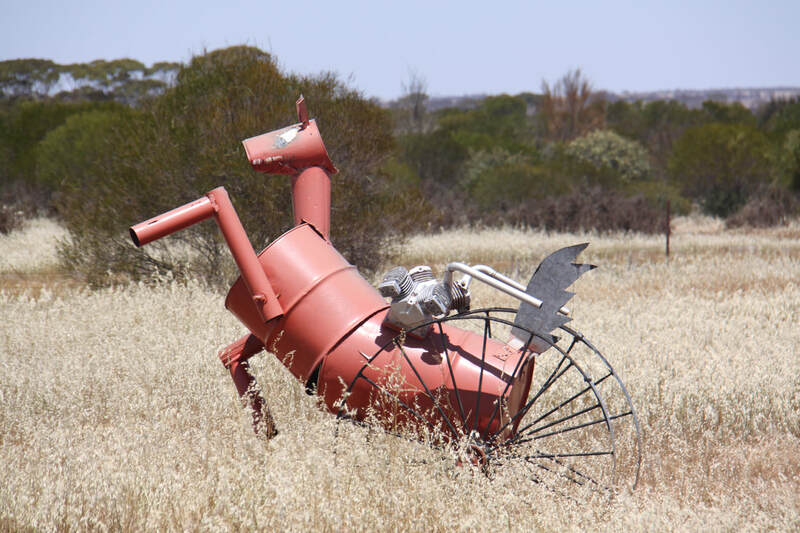 Dubbed as a "Quirky Open-air Gallery", the Tin Horse Trail is described as Western Australia's most hilarious highway. 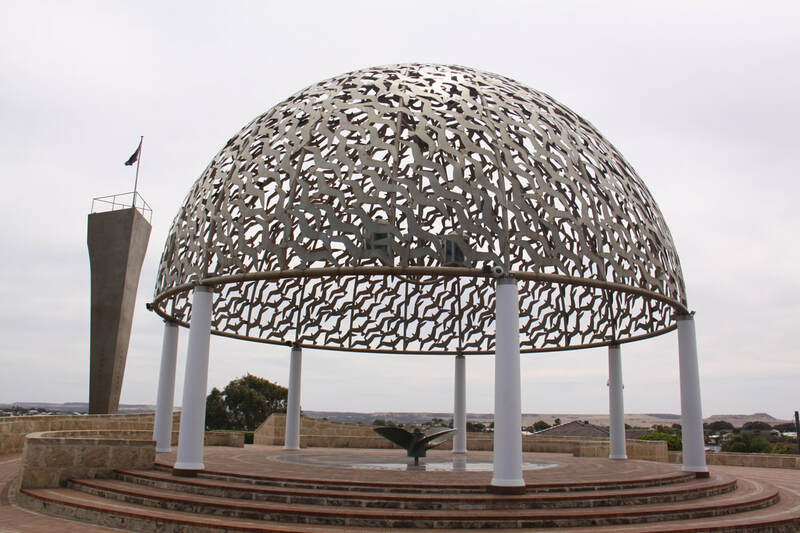 The first half, to the west of the pleasant little town of Kulin, is an introduction to the more famous eastern part. Brightly painted tin horse caricatures, made of oil drums, metal tubing and saw blades, with suitable props such as old cars, motorbikes, ploughs etc., line both sides of the road. Many of these "works of art" we're a play on well-known phrases such as "Feeling rather horse", "Australian Armed Horses" and "Ben Horse Chariot Race". Others featured horses as ballerinas, hockey players, skate boarders etc. Sufficient to say that it took us over three hours to drive the thirty kilometres of the two sections of the highway, with John stopping every few yards so that I could get out or take a photo through the cab window. 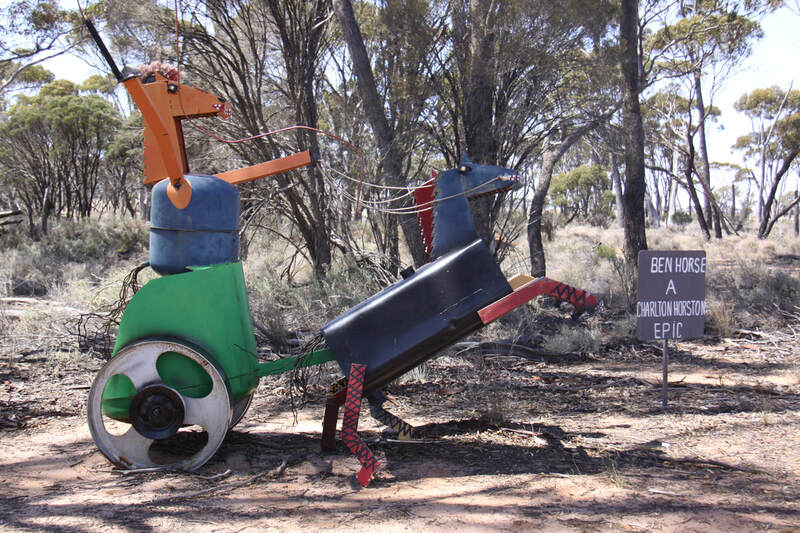 The town of Kulin itself was full of quirky works of art including the "Season's Wheel" and a discovery trail of children's art under the theme of "How we see our town". 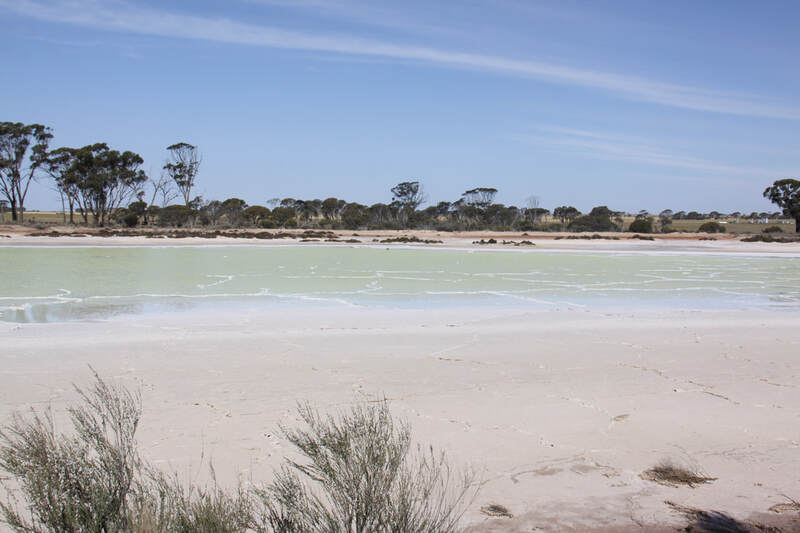 Our route to Lake Grace, where we stopped for the night, took us past some beautiful salt lakes, one of which was a distinctive pale green in colour. 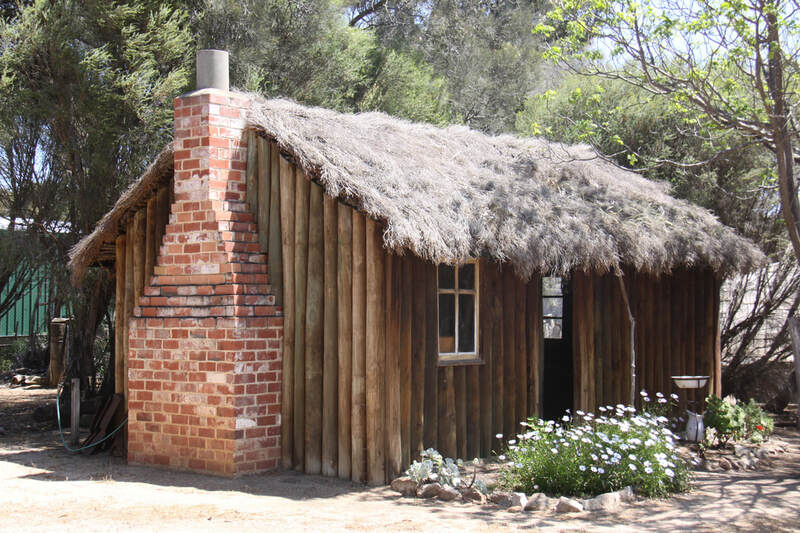 Before we left Lake Grace, we went to visit the last remaining Australian Inland Mission Hospital which has been restored and is now a museum, showing how the medical needs of the early settlers were met. Unfortunately it was not open today so we peered through the windows to see as much as we could. We then followed the road south, in search of the "elusive" pink lake. We passed numerous salt lakes of various shades of blue and green, and many that were dried up completely, but no pink ones. 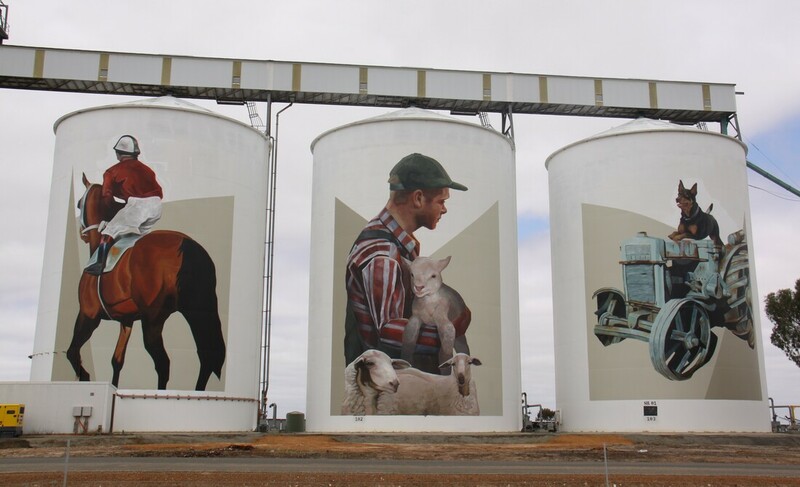 At Pingrup we detoured of the road to view the eye-catching silo art. Much to our amazement there were two small "pink" lakes right there beside the road! Success at last. We left the flat wheat lands behind and found ourselves in hillier terrain with sheep farming once again as we continued our journey to Dumbleyung, our destination for the night. Dumbleyung, or rather its lake, is famous for being the stretch of water where Donald Campbell, in Bluebird, broke the world water speed record in 1964, the same year as he had earlier broken the world land speed record. In the town there is a full size replica of Bluebird, two statues of Donald Campbell and a small museum dedicated to his achievements. We spent the afternoon in the museum and town before heading to the RV parking at Stubbs Park. Tomorrow we will head to the lake itself, 14km outside of town. We started today by visiting Lake Dumbleyung where Donald Campbell made his epic world water speed record. "Dumbleyung" means "Large Lake" in the local Aboriginal language, and the lake is in fact the largest in Western Australia. Although it is over four metres deep in places, it often dries up completely. At present it is completely full, the first time in decades. Along much of its shore, dead trees stand in the water. Overlooking the lake is Pussycat Hill with its lookout and the historic plaque celebrating Donald Campbell's success. 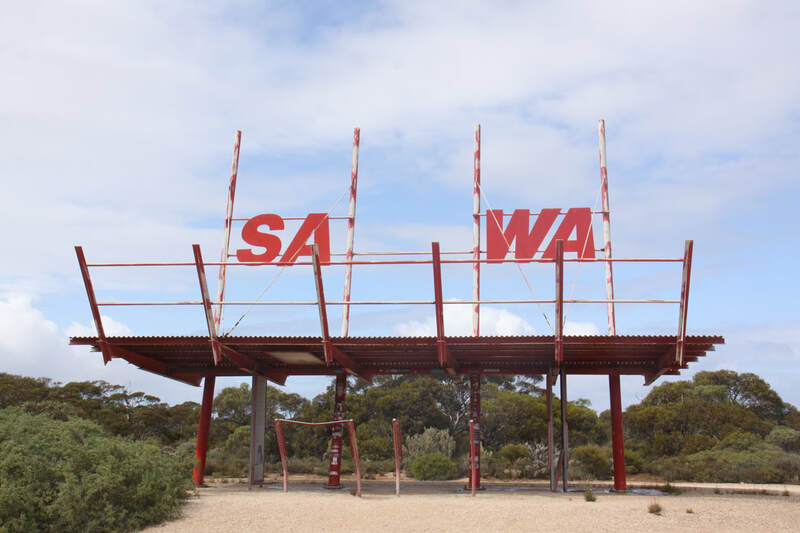 ​Our next stop was in the small town of Wagin. 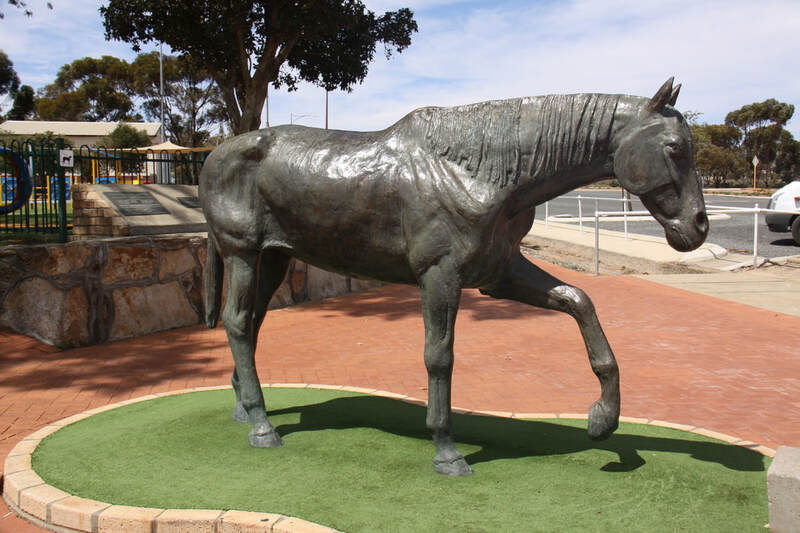 Here a giant, 13 metre high, ram names Baart stands sentinel to the town's thriving merino stud industry. "As I was going to Wagin, upon a Saturday. I saw the biggest ram, Sir, that was ever made of clay. It's the truth, it's the truth, it's the truth, the truth, the truth!" 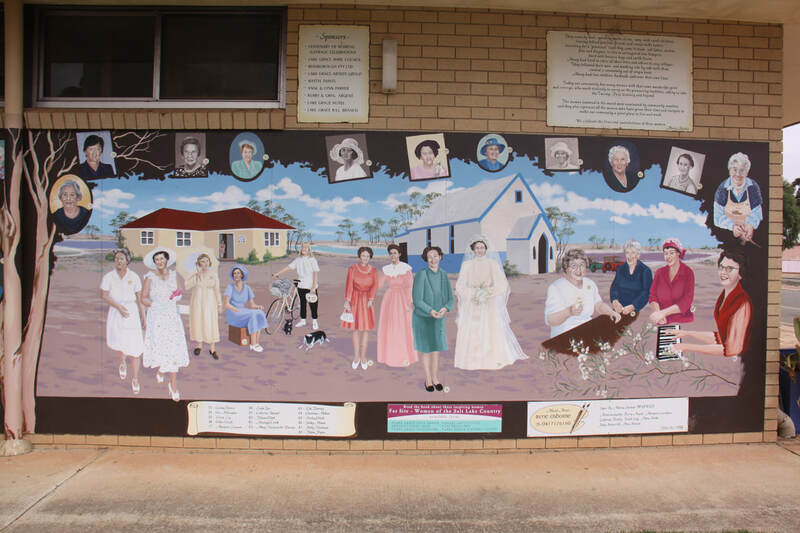 ​Wagin is also home to a Historical Village Museum, a collection of historical or recreated buildings ranging from the earliest bag tents, made by stitching hessian sacks over a framework of tree branches, and wattle and daub two room cottages, to the comparatively modern structures of the early 1900s. As well as the buildings there was a large collection of trucks, tractors and agricultural machinery. It was a well presented living history experience displaying how the early pioneers lived and worked in and around a small rural town. We overnighted in the small settlement of Highbury. We headed into Narrogin first thing this morning in search of a supermarket and wifi. However, the whole town was virtually deserted and the main supermarket did not open on a Sunday. We twice asked for directions to the other supermarket but failed to find it! The Tourist Office was also closed - a sign on the door said it was opening at 10am. It was ten minutes past ten, we came back 45 minutes later but it was still closed. Our next stop was in the small settlement of Wickepin where we viewed the Albert Facet homestead which is still furnished as it was one hundred years ago. Albert was originally a homesteader, who later became a famous author. Despite his fame and fortune he continued to live in the same small house. The next town, Pingelly was slightly better - no wifi, but a supermarket that was open and a cafe where they served an enormous helping of fish, chips and salad. Even the RV dump was open, unlike the one in Narrogin which was padlocked! It has been very hot today with little wind so it was a relief to find a shady rest area just south of York. Total distance travelled today - 7 miles! 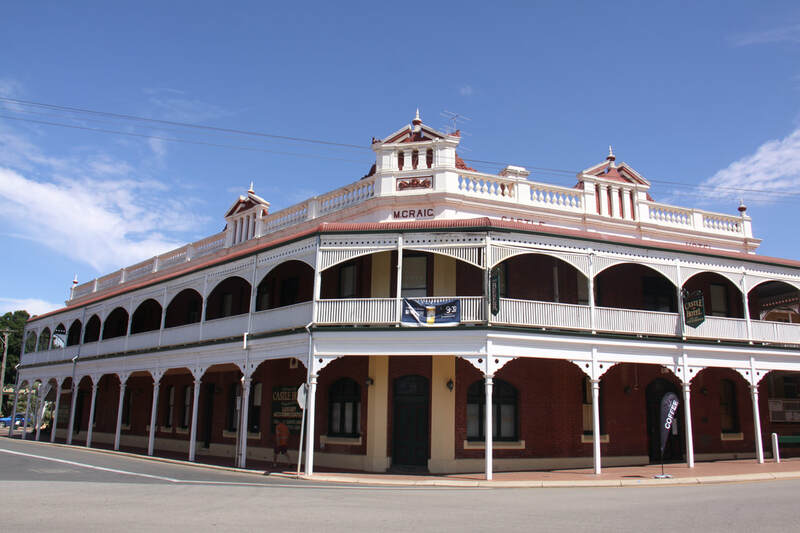 The small town of York, Western Australia's first inland town, was settled in 1831. 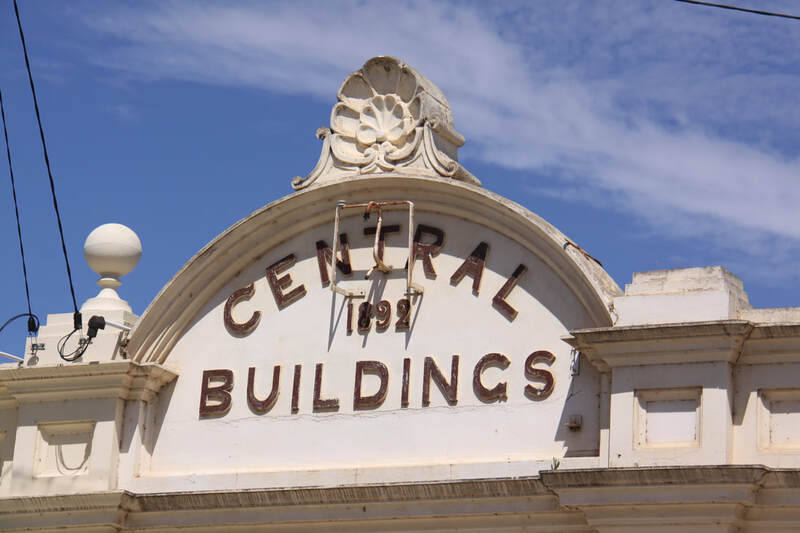 It is a pretty, unspoiled town with many buildings dating back to the 1890s when York became the last stop before the trek to the goldfields near Coolgardie. Many of the original buildings were built by convict labour, as was the original swing bridge over the River Avon. A pleasant park beside the river is where the 24 hour RV rest area is located and it is here that we stopped for the night. There were even free electric hook-ups for those who got there first. Most of this morning was spent in York. Whilst I wandered the town taking photographs, John went into the Car Museum. Originally a private collection it is now community owned. The collection contained world land speed record breakers, some very early cars including the first car in Western Australia, a 1898 Benz, toy pedal cars and motorcycles. There were a few British cars, including a 1948 Morris Minor, Vauxhall Viva, Morgan Three Wheeler, and a 1935 MG sports car. Elvis Presley's favourite, a Cadillac Eldorado, with masses of chrome and huge fins, was the only American car - apparently Elvis bought over a hundred of these and gave most to family and friends. This, and the huge Australia 6 speed, dwarfed the two tiny bubble cars, no bigger than the children's pedal cars! After leaving York we headed to Northampton for groceries before joining the Great Northern Highway. We stopped at New Norcia for the night. 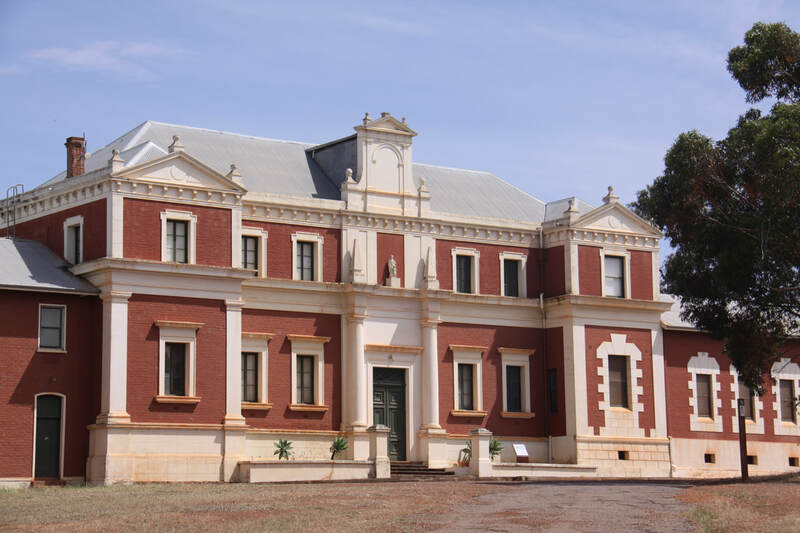 New Norcia is the home of Benedictine monks and is Australia's only monastic town. Before leaving New Norcia this morning we wandered around part of the extensive and elaborate buildings. The settlement dates from 1846 and the buildings are of Spanish inspired design. From New Norcia our route north took us through the heart of Western Australia's wildflower country. Unfortunately our visit was right at the end of the flowering season so we didn't see the carpets of wild flowers at their best. However, along stretches of our route there were still patches of colour. Just before stopping for the night at Three Springs rest area, we passed the Yarra Yarra lakes. These are salt lakes, which at present are pretty much dried up. A beautiful drive today, once again through wildflower countryside. Fields of cereal crops stretched to the horizon whilst the verges were flowering bushes and trees with the odd patch of late flowering wild flowers and clusters of Banksia. We reached Geraldton by mid-day and claimed a pitch on the busy 24 hour rest area on the harbour side, before heading in search of lunch. We spent the afternoon exploring the old town streets and strolling along the promenade and beachside. This morning we visited the moving memorial to. "HMAS Sydney II" which is located on a hill overlooking the town and harbour. In 1941 the ship was lost during a battle with the "Kormoran", a German merchant ship disguised as a Dutch ship. All 645 crew lost their lives. The exact resting place of the ship was not known until 2008 when the wreck was discovered 200km off Steep Point near Shark Bay, some 22km away from the wreck of the Kormoran. The monument itself has a dome made up of seagull cutouts set on a plinth of granite which has a propeller set into it. A separate structure represented the bow of the ship while a semi-circular wall had the names of the crew engraved on it and a brief history of the ship. ​Before leaving Geraldton and heading south we visited the Cathedral of St. Francis Xavier. The building was completed in 1938. The inside of the cathedral was made up of grey and orange stripes with beautiful stained glass windows. Today it was decorated with hundreds of knitted poppies made into hanging strips and beautiful wreaths. The organist was rehearsing for a concert, so all in all, the visit was inspiring. In Greenough we stopped to look at the leaning trees. Here, local eucalyptus trees have been buffeted by the prevailing winds off the Indian Ocean (there is no land between here and South America) so much that they grow horizontally and almost lie flat to the ground. 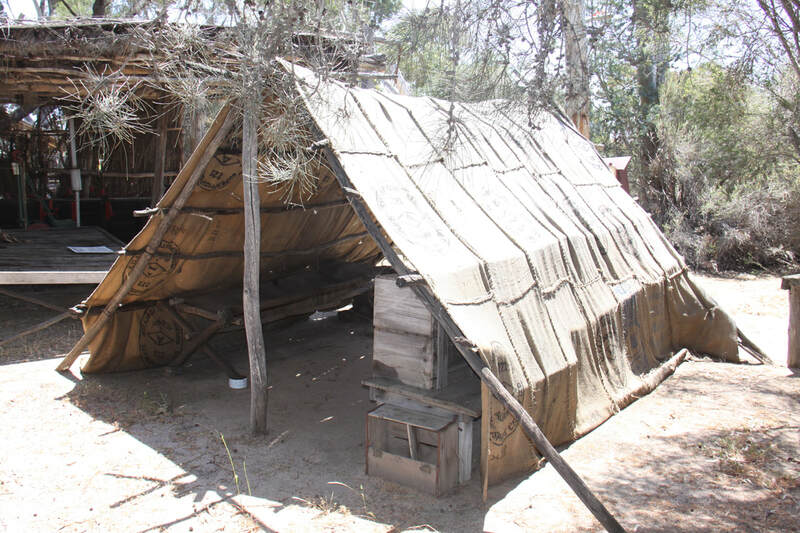 ​Just a few miles inland from Geraldton is the small settlement of Walkaway. The origin of the name is intriguing, and it is called Walkaway on three counts - the Aborigine name is " Wallawa", which means "A Gap in the Hills", secondly, in 1860, a few families "walked away" from their land after a crop failure, and, finally, when the railway came to town the line only went as far as Geraldton so passengers had to disembark and "walk away"! Here we visited the station museum which was a time warp of what a station would have looked like in the 1880s. ​We overnighted on an exposed rest area by "Seven Mile Beach". The sky was heavy and a strong wind was blowing. The waves were crashing over the reef. Just before sunset the clouds parted and there was the most glorious sunset as the sun disappeared into the Indian Ocean and the sky was lit up in glorious colours. A short drive south brought us to Dongara where we wandered through the small Saturday market. 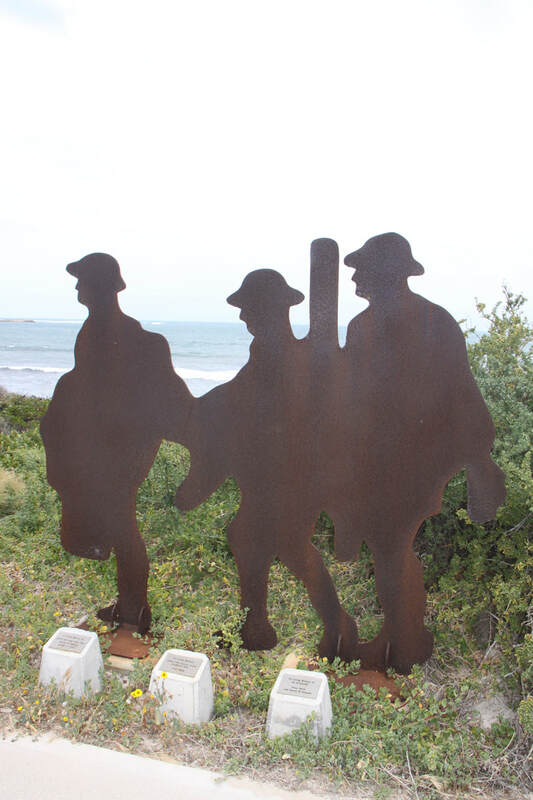 Adjoining the town was Port Denison where along the esplanade, fifteen full size soldier statues made out of 2D metal stand looking out to sea, as a memorial to local men and women who made the ultimate sacrifice during WW1. A little further along the coast the Fishermen's Lookout and Memorial stand on a headland with magnificent views of the port and out to the reefs. The coast road south passed through low scrubland edged with brilliant white sand dunes. Our camp spot for the night was situated between the Indian Ocean Highway and the coast - we had a lovely view out to the reef and ocean beyond. Spent the day relaxing at our idyllic camping spot by the beach, overlooking the Indian Ocean. We continued our drive down the Indian Ocean Highway, passing through scrubland and gleaming white sand dunes with a brilliant azure ocean to our right. We stopped for fuel, food and wifi at Jurien Bay. 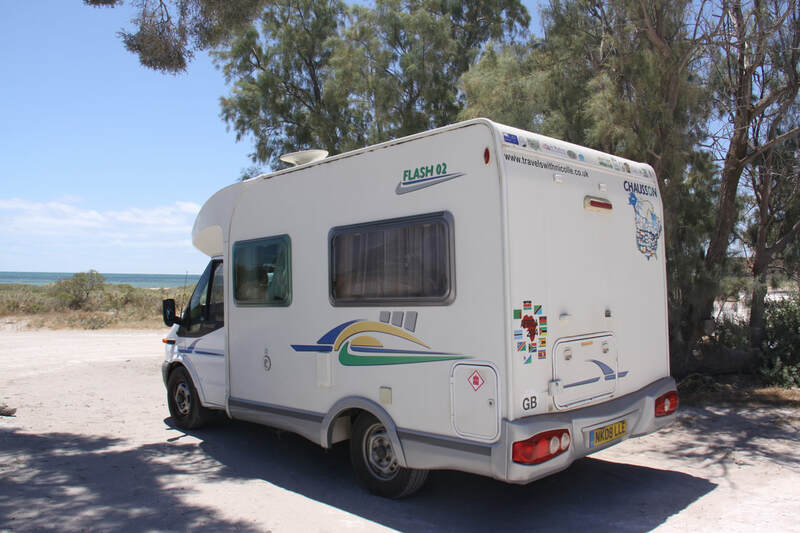 Our overnight stop was on the campground at Yanchep National Park. After leaving the campsite we went to view the koalas from the broadwalk in the National Park. We spotted a number of koalas asleep high up in trees, however, as they are nocturnal, we were surprised to spot one koala slowly munching away at the tasty eucalyptus leaves and quite oblivious to the clicking cameras. Next, in the carpark, we spotted a wallaby with the tiniest joey, so wobbly on its legs that it kept collapsing. When the mother hopped over the kerb, her baby was unable to follow! The mother kept boxing the joey around the head, but it didn't seem perturbed. Yanchep National Park seemed more like a garden than a reserve ~ a formal garden, manicured lawns and an ornamental lake. An hour's drive south and we reached the Swan Valley, Western Australia's oldest wine producing area. Since being swallowed up by the Greater Perth region it now seems to have more housing estates than vineyards. We booked onto the Swan Valley Caravan Park for the next three nights. This morning was spent at Caversham Wildlife Park. This is a private zoo with many birds, reptiles, small marsupials as well as the better known kangaroos, including white kangaroos, wallaby, koalas and wombats. It was well set out with clear notes on each bird and animal. 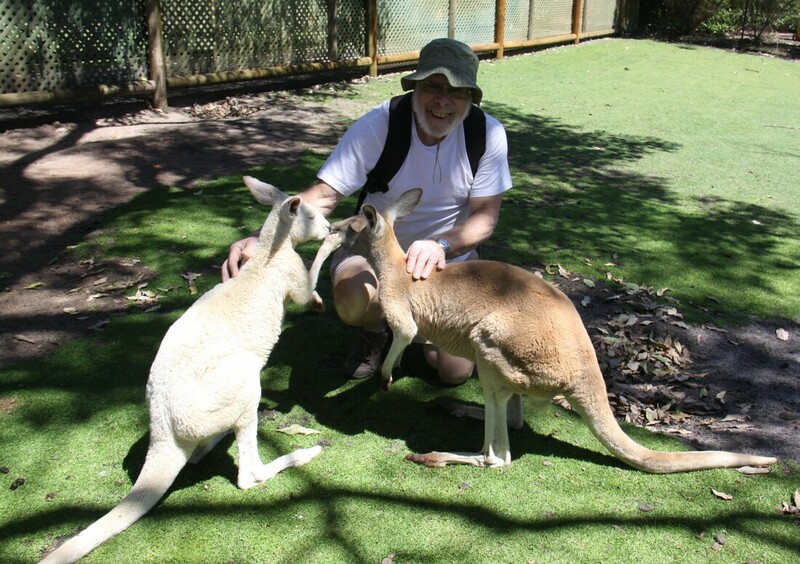 One of the highlights was a large enclosure where you could feed and pet both kangaroos and wallabies. We also had the opportunity to see a cassowary close up ~ a real treat as we had failed to see one in the wild when we were in the Daintree Rain Forest in Northern Queensland. After lunch in the park cafeteria, we wandered round the rest of Whiteman Park before heading to Ellenbrook, a new town close to our campsite. River. It is only about 15km from the centre of Perth so was an ideal place to park Nicolle in the large station car park while we caught the train, a journey of less than half an hour. Total cost of train and parking was the equivalent of less than £5. Perth has a free bus service within the Central Business District as well as out to King's Park. We caught the Blue Cat bus to Elizabeth Quay. 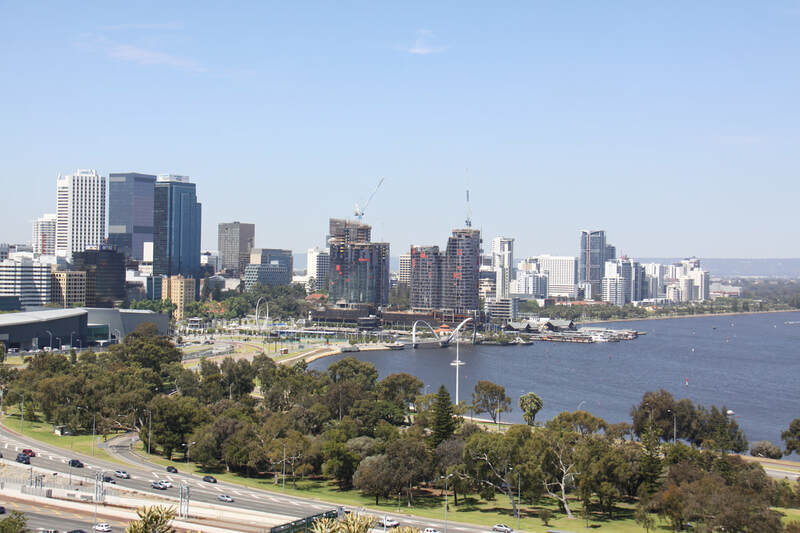 The area around the waterfront is still being developed, however we were there to view the Bell Tower which was opened in 2000 as Western Australia's Millennium project. Unfortunately sky scrapers around the tower mar the view from the top. Within the heart of the tower are twelve bells that were originally located in St. Martins in the Fields church in the centre of London. These bells date from the time of Elizabeth 1st. Other bells, including a "great" bell named the Anzac Bell which commemorates the centenary of the ending of World War I, completes the set of bells in the tower. Kings Park is situated on a bluff overlooking the city and the Swan River. The views are amazing and far reaching. 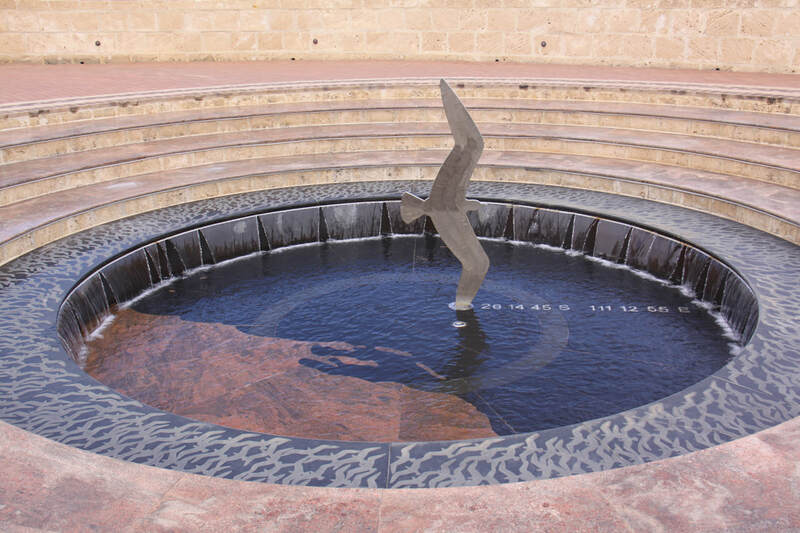 Our first stop was at the Western Australia State War Memorial and Memorial Pool with its eternal flame. As it is Remembrance Sunday in three days time there was a sea of poppies, all hand knitted. Within the state evidently over sixty thousand have been made. 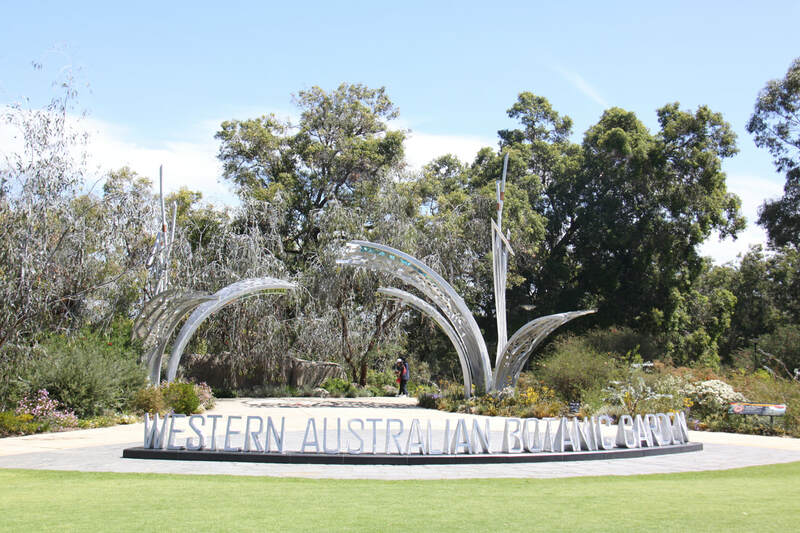 The Western Australian Botanic Gardens are laid out in zones depicting some of the amazing flora found within the state. Plants are named and informative boards give details. A baob tree was moved over a thousand kilometres to the park! We followed a pleasant circular walk through the gardens with only one slight mishap - John sat down on a bench and was dive bombed by a wattlebird. We returned to our Swan Valley campsite for a final night before heading to Fremantle and completing our six month journey around Australia. Today we moved back to the campsite in Fremantle where our adventure had started six months ago. The next few days will be spent sorting out Nicolle and cleaning her inside and out so that she passes the inspection before she can be accepted for shipment back to the UK. ​Having seen very few other Europeans all trip, we are now surrounded by them. Mostly German but a few Swiss and a couple of Austrians. Two couples have driven here all the way in their motorhomes, another couple have sailed here in their own yacht! On Wednesday 14th November at 9.30am we meet Ryan at the docks and leave Nicolle for her sea voyage home. We fly back to Heathrow later that day.